Médica dermatopatóloga, Hospital Pablo Tobón Uribe, Medellín, Colombia. El síndrome de nevo sebáceo lineal es una facomatosis poco frecuente, originado por un ‘mosaicismo’ genético que involucra mutaciones del gen autosómico dominante HRAS o KRAS. Se caracteriza por la coexistencia de nevo sebáceo con alteraciones multisistémicas, por lo cual se requiere un enfoque multidisciplinario para su manejo. Su diagnóstico es clínico; sin embargo, en ocasiones es difícil por el poco conocimiento del síndrome. El nevo sebáceo se asocia con el desarrollo de neoplasias secundarias, en su gran mayoría benignas, y sólo unos pocos casos progresan a neoplasias malignas. nevo sebáceo de Jadassohn; síndromes neurocutáneos; mosaicio; neoplasias. Linear nevus sebaceous syndrome is an infrequent phakomatosis created by a genetic mosaicism which involves HRAS o KRAS autosomal dominant gene mutation. It is characterized by the coexistence of nevus sebaceous with multisystemic disturbances; thereby, management of the linear nevus sebaceous syndrome requires a multidisciplinary approach. Its diagnosis is clinical; however, occasionally it is difficult due to poor knowledge of the syndrome. Nevus sebaceous is associated with the development of secondary neoplasms, most of which are benign, and just a few cases may progress to malignant neoplasms. nevus, sebaceous of Jadassohn; neurocutaneous syndromes; mosaicism; neoplasms. Figura 2. Hiperplasia epidérmica y aumento del número de glándulas sebáceas en la dermis, algunas de las cuales drenan anormalmente en la epidermis, acompañadas de folículos pilosos inmaduros. Biopsia de piel del entrecejo y la región submentoniana. Happle R. The group of epidermal nevus syndromes. J Am Acad Dermatol. 2010;63:1-22. Pérez J, Miranda A, Frías G. Síndrome de nevos sebáceos: comunicación de un caso y revisión de la bibliografía. Dermatol Rev Mex. 2010;54:150-3. 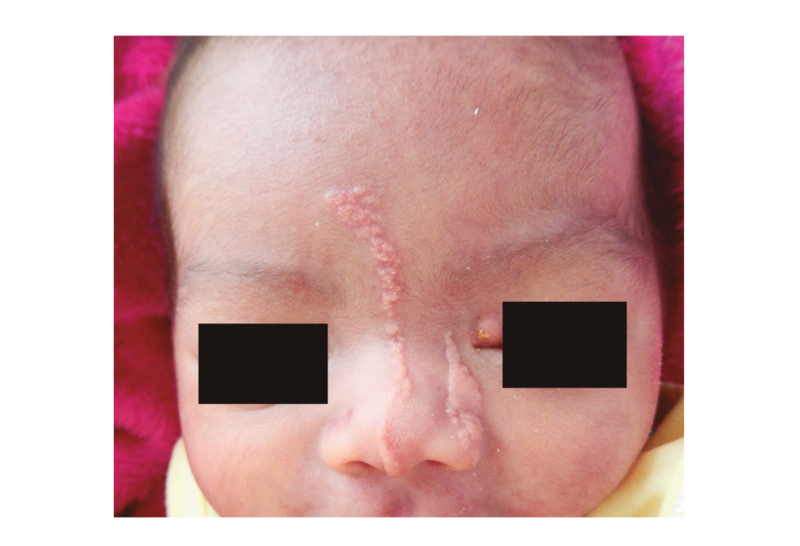 Wang H, Qian Y, Wu B, Zhang P, Zhou W. KRAS G12D mosaic mutation in a Chinese linear nevus sebaceous syndrome infant. BMC Med Genet. 2015;16:1-5. Vujevich JJ, Mancini AJ. The epidermal nevus syndromes: Multisystem disorders. J Am Acad Dermatol. 2004;50:957-61. Eisen DB, Michael DJ. Sebaceous lesions and their associated syndromes: Part II. J Am Acad Dermatol. 2009;61:563-78. Wright TS. Nevus sebaceous and nevus sebaceous syndrome. UpToDate. 2014. Menascu S, Donner EJ. Linear nevus sebaceous syndrome: Case reports and review of the literature. Pediatr Neurol. 2008;38:207-10. Barkovich AJ, Raybaud CA. Neuroimaging in disorders of cortical development. Neuroimaging Clin N Am. 2004;14:231-54. 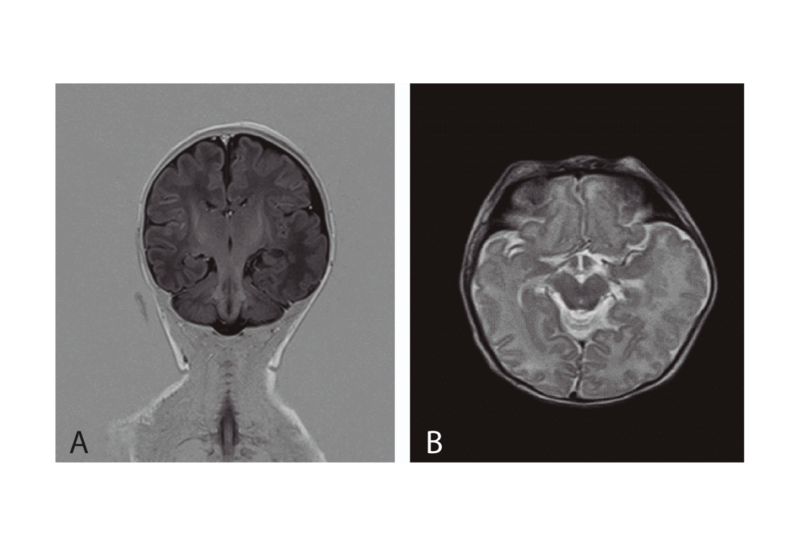 Pavlidis E, Cantalupo G, Boria S, Cossu G, Pisani F. Hemimegalencephalic variant of epidermal nevus syndrome: Case report and literature review. Eur J Paediatr Neurol. 2012;16:332-42. Idriss MH, Elston DM. Secondary neoplasms associated with nevus sebaceus of Jadassohn: A study of 707 cases. J Am Acad Dermatol. 2014;70:332-7. Kiedrowicz M, Kacalak-rzepka A, Królicki A, Maleszka R, Bielecka-grzela S. Therapeutic effects of CO2 laser therapy of linear nevus sebaceous in the course of the Schimmelpenning-Feuerstein-Mims syndrome. Postep Derm Alergol. 2013;320-3.